Abstract: This paper presents a novel approach to sensor-based feature evaluation and selection using a self-organizing map and spatial statistics as a combined technique applied to tool condition monitoring of the turning process. This approach takes advantage of the unique features of unsupervised neural networks combined with spatial statistics to perform analyses into the contributions of the different sensor-based features, carrying large quantities of noise, to achieve a classification of tool wear and a quantitative measure of each feature's suitability. This method does not assume a prior direct correlation between features avoiding misconstructions inherent to common approaches that assume that only obviously correlated features should be considered for condition monitoring. Instead, and taking advantage of neural networks ability to perform non-linear modeling, it has allowed a prior modeling of the process and then analyzed each feature's contribution toward classification. It was found that some of the commonly used features have proven to have a significant contribution to the classification of cutting tool wear, whereas others adversely affect classification performance. Further, it is demonstrated that the proposed combined technique can be used extensively to quantitatively evaluate the contribution of different features toward system monitoring in the presence of noisy data. Abstract: Design protocol data analysis methods form a well-known set of techniques used by design researchers to further understand the conceptual design process. Verbal protocols are a popular technique used to analyze design activities. However, verbal protocols are known to have some limitations. A recurring problem in design protocol analysis is to segment and code protocol data into logical and semantic units. This is usually a manual step and little work has been done on fully automated segmentation techniques. Physiological signals such as electroencephalograms (EEG) can provide assistance in solving this problem. Such problems are typical inverse problems that occur in the line of research. A thought process needs to be reconstructed from its output, an EEG signal. We propose an EEG-based method for design protocol coding and segmentation. We provide experimental validation of our methods and compare manual segmentation by domain experts to algorithmic segmentation using EEG. The best performing automated segmentation method (when manual segmentation is the baseline) is found to have an average deviation from manual segmentations of 2 s. Furthermore, EEG-based segmentation can identify cognitive structures that simple observation of design protocols cannot. EEG-based segmentation does not replace complex domain expert segmentation but rather complements it. Techniques such as verbal protocols are known to fail in some circumstances. EEG-based segmentation has the added feature that it is fully automated and can be readily integrated in engineering systems and subsystems. It is effectively a window into the mind. Abstract: Information technologies are a driving force for progress in the design field, allowing new modes of creativity. However, most of the existing computational design tools are focused on the latest stages of the design process and especially directed to drafting operations. Conceptual design tools that support the designer in the creative and inventive early stages of the design project are still in their early development. Shape grammars (SG) were introduced by George Stiny in the 1970s, allowing the generation of designs according to a set of predefined rules. SG computational implementations have the potential to answer the need for tools that can assist designers, architects, and artists in the creative process, offering design alternatives, stimulating new ideas and encouraging the search for new design generation processes. Acknowledging this potential, a user-friendly interface seems essential for the adoption of these tools. Taking Scott Chase's interaction model as background, the aim of the present investigation is to define guidelines and begin to design a graphical-user interface for SG implementations. Inspection methods of human–computer interaction (HCI) were used to analyze existing SG implementations and understand usability issues. Subsequently, HCI ergonomic criteria for interface evaluation were adapted to establish guidelines for the design of an SG implementation interface, called IM-sqi. These guidelines take into account different user groups, adjustable interaction modes for each user group, and the nature of each task performed by the user. Abstract: To be useful for architects and related designers searching for creative, expressive forms, performance-based digital tools must generate a diverse range of design solutions. This gives the designer flexibility to choose from a number of high-performing designs based on aesthetic preferences or other priorities. However, there is no single established method for measuring diversity in the context of computational design, especially in the field of architecture. This paper explores different metrics for quantifying diversity in parametric design, which is an increasingly common digital approach to early-stage exploration, and tests how human users perceive these diversity measurements. It first provides a review of existing methodologies for measuring diversity and describes how they can be adapted for parametrically formulated design spaces. This paper then tests how these different metrics align with human perception of design diversity through an online visual survey. Finally, it offers a quantitative comparison between the different methods and a discussion of their attributes and potential applications. In general, the comparison indicates that at the level of diversity difference that becomes visually meaningful to humans, the measurable difference between metrics is small. This paper informs future researchers, developers, and designers about the measurement of diversity in parametric design, and can stimulate further studies into the perception of diversity within sets of design options, as well as new design methodologies that combine architectural novelty and performance. Abstract: We present a novel and trainable gesture-based system for next-generation intelligent interfaces. The system requires a non-contact depth sensing device such as an RGB-D (color and depth) camera for user input. The camera records the user's static hand pose and palm center dynamic motion trajectory. Both static pose and dynamic trajectory are used independently to provide commands to the interface. The sketches/symbols formed by palm center trajectory is recognized by the Support Vector Machine classifier. Sketch/symbol recognition process is based on a set of geometrical and statistical features. Static hand pose recognizer is incorporated to expand the functionalities of our system. Static hand pose recognizer is used in conjunction with sketch classification algorithm to develop a robust and effective system for natural and intuitive interaction. To evaluate the performance of the system user studies were performed on multiple participants. The efficacy of the presented system is demonstrated using multiple interfaces developed for different tasks including computer-aided design modeling. Abstract: This study investigates the use of similarities in the form of analogy, metaphor, and simile by students and reviewers in an undergraduate architectural design review. In contrast to studies conducted in vitro settings, this study emphasizes the importance of studying analogies, metaphors, and similes in a natural setting. All similarity relationships were coded according to their type, the level of expertise, range, frequency, goal, value judgment, and depth. The results indicate that analogies, metaphors, and similes were used spontaneously and without any difficulty by both reviewers and students. Reviewers, however, were almost twice as likely to evoke similarities. Metaphor was the most frequently used similarity relationship among the three. It was found that there was a significant relationship between the level of expertise and type of similarity, with students more likely to use analogies and less likely to use similes. It was also found that goal is the most important factor, with a significant relation to all other variables, and that embodiment is often invoked in both students’ and reviewers’ metaphors. We conclude that design education should take full advantage of students’ natural ability to benefit from similarity relationships. Abstract: Complex engineered systems design is a collaborative activity. To design a system, experts from the relevant disciplines must work together to create the best overall system from their individual components. This situation is analogous to a multiagent system in which agents solve individual parts of a larger problem in a coordinated way. Current multiagent models of design teams, however, do not capture this distributed aspect of design teams – instead either representing designers as agents which control all variables, measuring organizational outcomes instead of design outcomes, or representing different aspects of distributed design, such as negotiation. This paper presents a new model which captures the distributed nature of complex systems design by decomposing the ability to control design variables to individual computational designers acting on a problem with shared constraints. These designers are represented as a multiagent learning system which is shown to perform similarly to a centralized optimization algorithm on the same domain. When used as a model, this multiagent system is shown to perform better when the level of designer exploration is not decayed but is instead controlled based on the increase of design knowledge, suggesting that designers in multidisciplinary teams should not simply reduce the scope of design exploration over time, but should adapt based on changes in their collective knowledge of the design space. This multiagent system is further shown to produce better-performing designs when computational designers design collaboratively as opposed to independently, confirming the importance of collaboration in complex systems design. 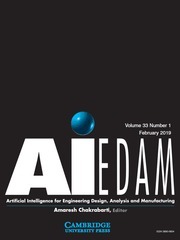 Abstract: In this paper, we report on a data analysis process for the automated classification of mechanical components. In particular, here, we describe, how to implement a machine learning system for the automated classification of parts belonging to several sub-categories. We collect models that are typically used in the mechanical industry, and then we represent each object by a collection of features. We illustrate how to set-up a supervised multi-layer artificial neural network with an ad-hoc classification schema. We test our solution on a dataset formed by 2354 elements described by 875 features and spanned among 15 sub-categories. We state the accuracy of classification in terms of average area under ROC curves and the ability to classify 606 unknown 3D objects by similarity coefficients. Our parts’ classification system outperforms a classifier based on the Light Field Descriptor, which, as far as we know, actually represents the gold standard for the identification of most types of 3D mechanical objects.